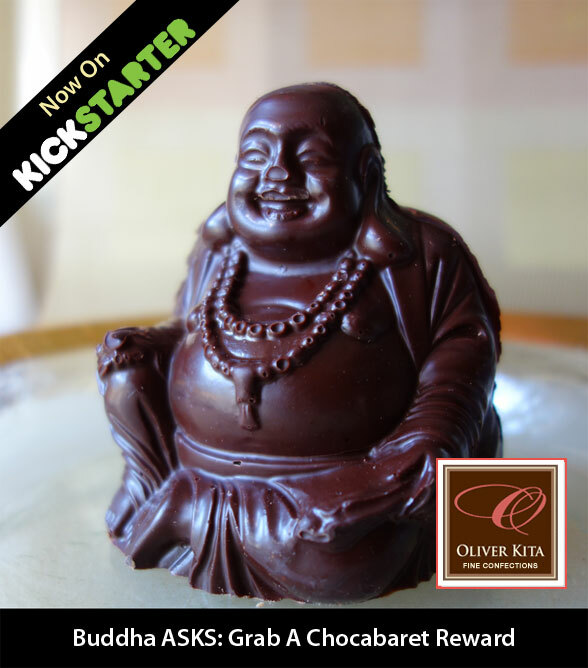 Oliver Kita’s Chocolate Buddha is in the NYC Ultra Gift Box Reward! Just ask. That’s apparently all you have to do to get people to help you. Sounds easy, but it’s not. NO ONE WANTS TO BE REJECTED. And yet, you’re guaranteed that if you ask, there are people who will say no. One: If you don’t ask, nothing happens. Yes, B.E.A.T. It Outta Them (Actually hitting people may work for some folks, but I don’t suggest it.). B.E.A.T. is an acronym for Believe, Easy, Ask and Thank YOU/ THANKS! BELIEVE: To get people to help you, you have to believe in two things: You have to believe you deserve to have what you want, and that people want to help you and will. I hear people often say, “I want this or I wish I had that….” and when I suggest asking for help, they jump in WITH, “No one is going to help me”. That’s a self-fulfilling prophecy. Since asking is so confronting, it’s often much easier to be dismissive. The problem with asking is we often want things that we’re ashamed of having. If we don’t believe we should have what we want, how will anyone else? Not believing you deserve to have what you want is one of the top reasons that people don’t get what they want. So believe in yourself. It’s not easy and it’s not constant, but your energy and attitude have to be on the side of “I deserve to have this”. When thoughts come up that undermine you, take a breath and focus on what your life would be like if you have the thing you want. Embody that. Believing that you’re deserving lays a path for people wanting to help you. People who know you and care about you and/or those who believe in you will help. Just ask. EASY: You have to make it easy for people to help you. Give them the tools. For my Kickstarter campaign I asked my network for help. I asked my blogger friends to blog. I asked my FAMILY AND friends to spread the word. I made it easy by sending pre-crafted emails, Facebook posts, tweets and Google+ posts. I made a landing page that makes it super easy to share and view the Chocabaret Kickstarter. I set up a press page to make it easy to get photos and information. People do want to help each other, but most of us have limited time to do so. Make sure you lay a foundation to make it easy for people to help you. The Unbelievable Discomfort Of Asking is something that most people experience. So when you ask them in a way where you call attention to the discomfort that comes with asking, they usually relate. What I find helpful is looking at your network and figuring out who your people are. People who are not likely to help. People who will help you as best they can. People who are your complete champions and believe in you. People who are connected to other people and have influence so they can ask on your behalf. All of them have value—yes, even the folks who don’t help—I can’t go into the many reasons that people are not likely to help, but there’s a zillion of ‘em. It’s a distraction to mull over the WHY? Focus most of your energy on the other three categories and just do a quick ask to the first category—you never know. Ask people within the other categories to help you in a way that reflects who the people are in relationship to you. Spend the most time on people whose help will have the greatest impact. THANKS: And finally T for Thanks! Don’t forget to say thank you for helping. A little gratitude goes far and a lot of gratitude goes even further. Each time I get an email telling me that a new person has backed Chocabaret, I shout THANK YOU! from the rooftops. Either I send an email or thank them publically via social media or both. On the subject of THANKS, I’ve been blown away by people who are supporting this project. There could be another intimidating side to asking for help that prevents people from doing so. This occurs when people help in ways and words that move you to your core by their generosity and how they value you. That sensation—that your heart might explode—is not for the feint hearted. If you’re like me, you’ll be a happy, blubbering, tearful mess in the face of it. I encourage you to find your people— ask away. That’s where the magic happens.